Jack has been ‘APPA-active’ since 1965 and is APPA Past President, and APPA Fellow. Jack served as chief facilities officer within public and private sector institutions including major research universities, large, medium, and small institutions. He retired from the University of California, San Diego in 2002 and is President, Hug Consulting and Management Services. A New Organizational View: What's Ahead for the Twenty-First-Century Facilities Management Organization? The design of the facilities management organization is ultimately the responsibility of the chief facilities officer. While others may be called on to participate in designing the organizational structure, to react to designs, to provide suggestions, or to help in planning implementation, it is ultimately the leader’s job to actively shape the organization. Management’s job is to turn complexity and specialization into performance. To ignore organization design is to throw away a potentially powerful tool for building effective and efficient organizations. This chapter is concerned with the big-picture of the organization and its major departments. Organizational design and structure is a vast complex area of study and a single chapter on the topic cannot begin to provide a complete survey of the field. The objective of this chapter is to help people to understand Educational Facility Management organization design and structure. In this chapter, we will address the most prevalent communities of practice in Educational Facilities Management organizational structural forms discovered from digging deep into existing college and university facilities management organization structures and from extensive reading of books and professional periodicals on this topic. This experience and learning supports the theory that while organizational design is not the answer to all problems in organizations, it frequently is an important component of significant efforts to enhance organizational efficiency and effectiveness. More than anything else, where the lines are drawn depends on what the organization is trying to accomplish and how it is trying to improve. No two organizations are exactly alike and differences matter. In most instances, the right thing to do in organizational design truly depends on the circumstances; the organizations history, mission, strategy, resources, the institutional context, scale, and scope, and the organizations external environment are almost always different from one institution to another and these differences must be considered when designing organizations. Experience teaches that organizational change can be disruptive and cause confusion. As you read through this chapter, keep one central thought in mind; the typical picture of an organization is a version of a pyramidal organization chart. The focus of this picture views the most critical factor of an organization as a stable or static structure with formal relationships among jobs and work units. Although this is one way to think about organizations, it is only one part of the picture. As we understand more about organizations, we begin to see that our picture excludes other important images such as leadership behavior, the impact of the environment and institutional context, informal relationships, and the flow of information and decision making power. Organization is much more than just a system or a set of lines and boxes. We will learn that it is not just about how we draw the lines and arrange the boxes; it’s also about why we do so and who we put into those boxes that matter also. First, the boundary lines, which separate what’s inside and what’s outside. Second, the lines of the organization chart, which map how the whole is divided into working units, and how each part relates to the other. Third, are the sometimes invisible, but always important, lines of authority. These determine who gets to decide what, and how the internal organization really works. So, what should your organization look like? How should you organize? And where should you draw the lines? In the concluding section of this chapter, "A New Organizational View," we explore the need to rethink the organization to help us recognize how Educational Facilities Management work has changed and consequently how to use organizational structure to find new ways of delivering products and services. The writings of Alfred A. Chandler Jr. “Strategy and Structure: Chapters in the History of the American Industrial Enterprise” first edition published in 1962 are most instructive and essential reading for those who want to build a foundational understanding of the beginning of the profession of business administration as an essential identifiable activity and its effect on organizational theory and design. Chandler began with an initial thought that an examination of the way different enterprises carried out the same activity; whether that activity was manufacturing, marketing, procurement, finance or administration, would have as much value as a study of a single firm carrying out all these activities. This comparative analysis did in fact provide the ways in which American businessmen have handled these activities over the years. In 1961 Chandler raised the question; what has been the structure used to administer these early great enterprises? And who were its innovators? A preliminary survey of the experience of fifty of the largest industrial enterprises in the United States helped to answer these questions. From this list Chandler selected multi-divisional organizations to study partly because these enterprises had faced significant challenges in organizational design and organization theory as the work of their respective organizations grew in size and complexity. The multi-divisional enterprises which he selected include: DuPont, General Motors, Standard Oil Company, New Jersey, and Sears, Roebuck and Company. Organizational design evolution for Educational Facility Managers is important because as we will see in this chapter, most facility management department organizational designs and structures today have many organizational elements derived from these earlier versions of the industrial organizational structure, administrative concepts, principles, and theory. As business and industries became larger and more complex, their executives were faced with more complex administrative problems. The enormous expansion of the American economy especially after World War II brought their administration practices to the attention of sociologists, anthropologists, economists, political scientists, and other scholars. In Organization Theory and Design; Richard L. Daft provides an instructive evolution of organizational theory and design, which helps us understand where a number of theories and design elements originate. Daft astutely notes, “Organization theory is not a collection of facts; it is a way of thinking about organizations. Organization theory is a way to see and analyze organizations more accurately and deeply than one otherwise could. The way to see and think about organizations is based on patterns and regularities in organizational design. Organizational scholars search for these regularities, define them, measure them, and make them available to the rest of us. The facts from the research are not as important as the general patterns and insights into organizational functioning. Insights from organization design research can help managers improve organizational efficiency and effectiveness, as well as strengthen the quality of organizational health.”4 Daft points out that the modern era of management theory began with the classical perspective in the late nineteenth and early twentieth century. The emergence of the factory system during the Industrial Revolution posed problems that earlier organizations had not encountered. During the Industrial Revolution, the perspective that sought to make organizations run like well-oiled machines is associated with the development of hierarchy and bureaucratic organizations. This “classical perspective” Daft emphasizes, remains the basis for much of modern management theory and practice. The classical perspective had its emphasis on efficiency and organization. Other perspectives began to emerge to address new concerns, such as employee needs and the role of the work environment. Elements of these early organizational perspectives are widely used in organization design today. Pioneered by Frederick Winslow Taylor, scientific management emphasizes scientifically determined jobs and management practices as the way to improve efficiency and labor productivity. Taylor proposes that workers “could be retooled like machines, their physical and mental gears recalibrated for better productivity.” He insisted that management itself would have to change and emphasized that decisions based on rules of thumb and tradition should be replaced with precise procedures developed after careful study of individual situations.5 To use this approach, managers develop precise, standard procedures for doing each job, select workers with appropriate abilities, train workers in the standard procedures, carefully plan work, and provided wage incentives to increase output. Although the days of separating the heads from the hands has mostly ended, the ideas of creating a system of maximum efficiency and organizing work for maximum productivity are deeply embedded into our facilities organizations. Today; with continuing slow economic growth in the Nation and in the Global economy, additional rounds of budget cuts are becoming a reality for many educational institutions. For facility managers there is a renewed interest in re-examining how facilities management work is done. We are once again experiencing an historical classical management perspective with an emphasis on efficiency and work management and organization. Only this time around, we have organizational experience and a number of new management tools with which to manage. These insights helped to establish organizational traditions that the role of management is to maintain stability and efficiency, with top managers doing the thinking and workers doing what they are told. Whereas scientific management focuses primarily on the people who do the basic work of the organization (such as producing the products and services of the organization, on the shop floor, and on the front-line), administrative principles look at the design and functioning of the organization as a whole. Daft recognizes, for example, that “managers in the early 1900s had very few external resources to draw upon to guide and develop their management practice. But thanks to early theorists like Henri Fayol (1841-1925), managers began to get the tools they needed to lead and manage more effectively. Fayol, and others like him, are responsible for building the foundations of modern management theory. These principles form the foundation for modern management practices and influence organizational design.”6 These principles clearly represent many of the administrative practices of Educational Facility Management. Fayol's principles are listed below. Division of Work – When employees are specialized, output can increase because they become increasingly skilled and efficient. Authority – Managers must have the authority to give orders, but they must also keep in mind that with authority comes responsibility. Discipline – Discipline must be upheld in organizations, but methods for doing so can vary. Unity of Command – Employees should have only one direct supervisor. Unity of Direction – Teams with the same objective should be working under the direction of one manager, using one plan. This will ensure that action is properly coordinated. Subordination of Individual Interests to the General Interest – The interests of one employee should not be allowed to become more important than those of the group. This includes managers. Remuneration – Employee satisfaction depends on fair remuneration for everyone. This includes financial and non-financial compensation. Centralization – This principle refers to how close employees are to the decision-making process. It is important to aim for an appropriate balance. Scalar Chain – Employees should be aware of where they stand in the organization's hierarchy, or chain of command. Order – The workplace facilities must be clean, tidy and safe for employees. Everything should have its place. Equity – Managers should be fair to staff at all times, both maintaining discipline as necessary and acting with kindness where appropriate. Stability of Tenure of Personnel – Managers should strive to minimize employee turnover. Personnel planning should be a priority. Initiative – Employees should be given the necessary level of freedom to create and carry out plans. Esprit de Corps – Organizations should strive to promote team spirit and unity. 6. Control (in the sense that a manager must receive feedback about a process in order to make necessary adjustments and analyze any deviations from standards). For you “senior” students of management studies, this list will remind you of the “four functions of management”; a framework routinely taught in business schools decades ago that included: planning, organizing, directing, and controlling. Human relations received little attention because of the prominence of scientific management. However a major breakthrough occurred with a series of experiments at a Chicago company; the Hawthorne Works of Western Electric Company in the late 1920’s and early 30’s.The Hawthorne Works was a model of American industrial production. The Hawthorn Works was the site of the first undertaking of social scientific research on the organization of work, managerial practice, and worker satisfaction. Interpretations of these studies concluded that positive treatment of employees improved their motivation and productivity. The publication of these findings lead to a revolution in worker treatment and laid the groundwork for more work in examining the treatment of workers, leadership practices, motivation, and human resource management. The resulting new human relations and behavioral approaches added new and important contributions to the study of management and organizations. However, the hierarchical and bureaucratic approaches that developed during the Industrial Revolution remained the primary approach to organizational design well into the 21st century. Although during the 1980’s it began to lead to problems because of increased global competition. This produced new corporate cultures and those of us who were managers during this time will remember that this had a profound impact on Educational Facilities Management Departments as well. Suddenly there was a frenzy of new management tools and ideas to drive us forward to value lean staff, flexible and more agile organizations, rapid response, closer to the customer practices, excellence, and total quality, process reengineering, key performance measures, innovation, collaboration, partnerships, and engaged employees. This emphasis lasted for decades and consequently organizations have undergone profound and far-reaching changes. Present-day influences on the shift in Educational Facilities Management organization design include; advances in information and communications technology, increasing understanding of the many interdependencies of facilities management organizational functions, increased educational levels of employees, growth of knowledge and the growth in the number of knowledge-workers, increasing quality-of-life expectations, and changing managerial philosophy’s about innovation, collaboration, and the value added by the achievement of genuine employee engagement. By some measures, Educational Facilities Management organizational design and practices are beginning to represent an authentic paradigm-shift. Yet the design of organizations continues to embody many elements of the old Classical Perspective of organizational design. Harold J. Leavitt in his book written in 2005; “Top Down-Why Hierarchies Are Here to Stay and How to Manage them More Effectively” has written “The reality seems to be that a great many scholars, educators, consultants, and executives simply don’t like what large hierarchies do to people and to productivity. Some people; those who are especially concerned with human welfare, might agree that hierarchies are commonplace, but feel that they are so bad for people that we should get rid of them. Other observers; those who are more concerned about effectiveness of organizations, believe that hierarchical architecture is just out-of-date, old fashioned, inefficient as well as inhumane. Must we really, in today’s world of knowledge and information, still deal with hierarchies’ archaic appendages, things like ranks and status and charts showing who reports to whom?”7 Today, hierarchies in Educational Facility Management organizations are patently obvious. Hierarchical organizational structures have dominated the Educational Facilities Management profession all during my five decade career in facilities management. Today, this design practice is demonstrably reinforced through any analysis of existing Educational Facilities Management organizations. The hierarchies are here to stay. This has implications for the organizational designer to match the work coordination needs and the human relations needs of the organization with an appropriate type and amount of lateral processes. Consequently, facility managers have responded to these needs by forming both formal and informal groups; organizational-overlays, teams and task-forces are created, special groups are formed for a particular problem solving assignment, and more is being done to achieve cross-functional practices. Today, there is great interest in removing barriers and encouraging voluntary cooperation, and collaboration. Indeed, the steep vertical hierarchies are changing-somewhat and these changes are generally positive. Some have flattened. (Figure-1;Trends in Organizational Shape). Giving people more autonomy is common and many organizations have opened horizontal/lateral coordination-linkages through the use of cross-functional work-flows and processes. The change that we are now experiencing is not new concepts and theory of neither organizational design nor new administrative principles. It is simply taking us a long time to get around to making the change. Jay R. Galbraith in his book “Organization Design”8 introduced the idea of organizational design as a continual decision process to bring about coherence among people, organizing form, and strategy. Galbraith presents the Star Model for linking different strategies to different organizations. The Star Model was developed in 1977 and is still highly regarded as an organizing tool. 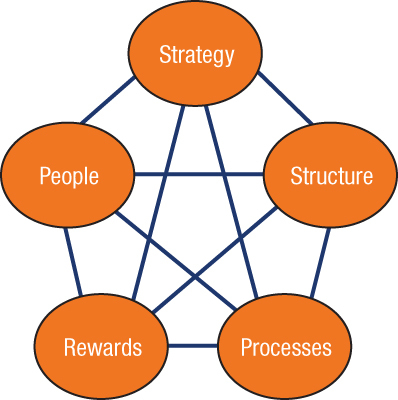 The Star Model is a generic configuration composed of strategy, structure, human resources, rewards, and management processes (Figure-2). The most prevalent practice that facilities managers follow today when addressing an organizational structure design or change, is to employ the comparative method; a review of facilities management organization charts from other institutions for guidance on how to structure their organizations. The problem with this approach is that all institutions have organizational elements that are unique or that represent specific differences. Identical comparisons are rarely possible. These differences matter. The different organizational elements could be a distinct strategy, unique personality of the leader, a particular physical and geographical location, special history of the organization, and other factors found by studying the institutional context and circumstances. When using a comparative method to look at another institutions' organizational structure, it is critically important to conduct a relevant dialogue with the facilities manager at the institution you are studying in order to capture an understanding of why a particular structure was selected. It is hard to escape the reality that the right thing to do when it comes to organizational design depends on the specific circumstances of your institution. Many problems result when facilities organization structure designs are treated as similar. Figure-3, Organization Differences, is a schematic that demonstrates both the general and the specific or unique organizational dimensions and helps in our understanding of these principles. 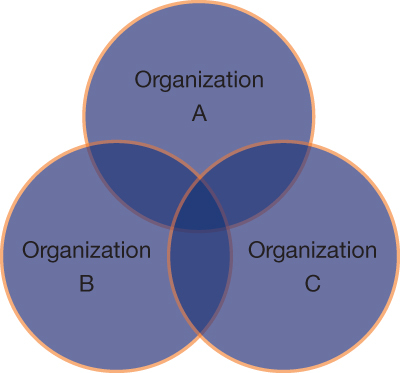 Assume that we can represent an organization by a circle: three different organizations and three different areas. The first area, represented by the dark-shaded portion, is the intersection of all three organizations. This means that on some dimensions, every facilities management organization is like every other facilities management organization. The second area, the lighter-shaded portions, contains dimensions in which an organization is like some organizations but unlike others. The third area, represented by the lightest-colored portions, represents those features that are unique to the specific organization. Organizational design is a continual choice process covering choices of strategy, organizing modes, and techniques of integrating individual and organizational interests. A few visible descendants of these early theories and practices of organizational design greatly influence the organizational design choices available to the facilities manager today. The classical and decision theorists contributed primarily to choices of organizing modes. The human relations theorists and the behavioral sciences approach deal mainly with the problem of integrating individual and organizational interests. Some of these include a choice of organizational forms; division of labor; authority and motivation; hierarchies of authority; chain of command, line, and staff workers; decision-making and information processes; compensation and reward systems; and the people approach, including selection, compensation, promotion, and job design. Today, our facilities management organizations are characterized by attempts to integrate these various concepts. There is an increasing emphasis on establishing coherence among organizational structure, information flows, work process flows, and people. Even though work may be structured into separate departments or functional activities, many facilities management organizations today are striving for greater horizontal coordination of work activities, often using teams of employees from different functional work areas to work together. Boundaries between departments as well as those between campus organizations are becoming more flexible and less accentuated as facilities organizations face the need to respond to changes more rapidly. Organizational design at its core involves choices. Organization design matters and an organization has a better chance of success if it is reflectively designed, nurturing and nudging the various pieces. Effective organizational design requires an in-depth consideration of a number of organizational elements. There is also a requirement that before putting organizational design on paper, to have an appreciation for the abundant differences in an organization’s specific contextual dimensions including: the larger organizational view, the institutional environment and context, Facilities Management Department’s distinct purpose (mission), operating principles and values, strategy, resources and capabilities. Once these contextual dimensions are understood, then and only then can we begin to draw the lines of the organization; its structural dimensions. Lest we get ahead of ourselves by jumping to the design of the organization, let us first remember that a facilities management department is only one part of a much larger institutional organization. Typically, the first piece of the larger organizational view is the higher education enterprise itself and an understanding of how a particular institution fits within this enterprise. The next piece is the institution's academic administration (those organizational pieces that encompass the institution's major responsibilities for teaching, research, public services, or health care) and then the nonacademic administrative organization (business and finance, campus services, and resource management). The facilities management organization typically follows as only one of numerous nonacademic campus administrative and service organizations. This larger view of the institutional organization positions the facilities organization as an important but proportionately small part of the overall structure of the institution, even though facilities management often is one of the largest nonacademic departments on campus. A number of similarities as well as some notable differences exist among higher education institutional organizational structures. Although no one size fits all, organizational design at the institutional level tends to have similarities based on a number of descriptive variables. These variables are contained in the Carnegie Classification of Institutions of Higher Education (www.http://classifications.carnegiefoundation.org). Facilities management organizations are challenged in many ways, and the successful organizations have developed leaders who have mastered the art of seeing the big picture of the institutional needs while at the same time continuing to be the campus champion for facilities. For facilities managers, failure to carefully plan the organization to meet its business objectives (mission, vision, strategy, and goals) and failure to dedicate time to design its organizational structure in harmony with mission, vision, strategy, and goals are where a great number of organizational problems start. It will be no surprise to the seasoned facilities manager that the identification of the facilities organization strategy and goals and the achievement of crystal-clear clarity and shared understanding of mission and vision remain elusive and obscure for many organizations. It is important during the early onset of examining the organizational structure and in the development of strategy to describe the organizational setting (its context) because it significantly influences and shapes the structural design and dimensions of the organization. “Whereas the structural dimensions of the organization include internal characteristics such as formalization, specialization, hierarchy of authority, centralization, professionalism, and personnel ratios, the contextual dimensions account for size, technology, work environment, goals, strategy, and culture.”9 A common management tool often employed to help identify and understand the particular situation in which the facilities organization finds itself is the environmental scan, also known as strengths, weaknesses, opportunities, and threats (SWOT) organizational analysis. The appropriate use of this tool will provide management insight and will increase a shared understanding among facility department members of the organization's internal strengths and weaknesses and the external environment opportunities and threats. A companion mnemonic, to the SWOT is STEEP; Social, Technological, Economical, Environmental, and Political. This management tool is also used to gain insight into the macro-external environment. The well-known STEEP tool is used all over the world as a basis for external analysis. A combination of the use of these two tools; SWOT and STEEP, coupled with the articulation of the facilities management organizational mission, vision, values, strategy, and goals will position the facilities manager to begin to think constructively and comprehensively about organizational design and structure. In the design of any organization, departmental boundary lines have to be drawn somewhere and are a critical part of the organizational workplace environment. These boundaries are usually drawn to group people and activities on the basis of functions and the logic of division of labor by putting like-type things together. Organizations have always had and will continue to have boundaries. People specialize in different tasks, and thus boundaries exist between functions. People have different levels of authority and influence, so boundaries exist between bosses and subordinates. People inside the organization do different work than suppliers, customers, and outsiders do, so boundaries exist there as well. In addition, people work in different places, under different conditions, and sometimes in different time zones, thus creating different boundaries. The underlying purpose of all these boundaries is to separate people, processes, and production in healthy and necessary ways. Boundaries keep things focused and distinct. Without them, organizations would be disorganized. People would not know what to do. There would be no differentiation of tasks, no coordination of resources and skills, and no sense of direction. In essence, the organization would cease to exist. For the facilities management organization, one would be hard pressed to improve on the exquisite treatment of this subject provided by William Middleton, former chief facilities management officer at the University of Virginia and past president of APPA. Middleton’s description provides the facilities management profession's collective thinking about facilities organization, structure, boundary, and scope and the triad of facilities management functions shown in Figure-4. Underlying the importance of each of these facilities management functional areas are the substantial financial needs of facilities acquisition, maintenance, and operation, renovation and alteration, and disposal at the end of useful life. In other words, the total cost of ownership TCO) throughout a facility and capital assets useful life. Traditionally, institutions of higher education generally function in these three broad areas in a loosely decentralized manner. For example, the process of facilities planning and acquisition is quite often carried out by a facilities planning and construction office or similar unit whose activities are confined to this function alone. Maintenance and repair, minor renovations, and the provision of utilities services are usually the responsibility of an independent buildings and grounds or facilities management department. Management of the process of facilities assignment and utilization is most often done by still another organizational unit, typically a staff function in the college or university administration. With the constantly shifting patterns of institutional organization that characterize most institutions of higher education, it is usually difficult to identify any clear-cut trends or directions in organizational concepts. Many important relationships among these three functional areas of the facilities management triad argue for a close organizational relationship among all three. For example, a close link between the assignment and utilization function and the facilities planning and acquisition process is essential to ensure that any programming for new facilities is based on real need. A careful analysis of the existing facilities inventory against a projection of requirements based on accepted space criteria and standards is an essential part of an effective facilities planning process. As facilities become ever more complex, a close and continuing dialogue between those who plan facilities and those who maintain and operate them becomes increasingly important. Such a dialogue ensures that the maintainability lessons learned by the maintenance and operating forces about specific materials and equipment — as well as the specific design requirements for efficient maintenance and operations — can be incorporated into plans and specifications for new construction. Finally, a close relationship among the staff members involved in the assignment and use of facilities and those involved in maintenance can focus limited maintenance resources on the areas of highest utilization or greatest need. 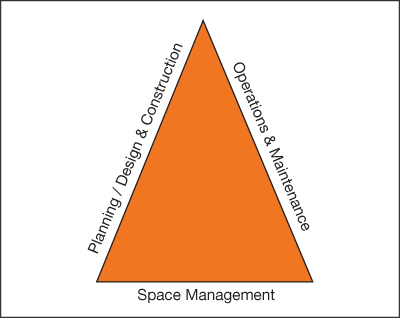 This triad organizational paradigm was most popular throughout the latter part of the twentieth century and remains popular today among facilities managers as the preferred structure of responsibilities. A comprehensive facilities management structure that includes all the organizational parts required to get the campus facilities management work done simply makes good sense. However, only a small percentage of the total population of colleges and university facilities management departments has succeeded in adopting this comprehensive organizational model. The APPA Body of Knowledge; Part-4 Planning, Design, and Construction include chapters on Real Estate, and Space Management. Over the past two decades, the functions of real-estate management and space planning and management have gained recognition as important facility management support services. The increasing awareness of the initial costs of space and the life-cycle costs of buildings; the total cost of ownership (TCO), and consequently its impact on the institution’s operation costs has had the effect of bringing the space and real estate dimension of the campus to the fore. There is now a growing acceptance that campus buildings must be managed as valuable institutional resources. Institutions of all sizes and especially those with large building and real estate portfolios recognize the strategic importance of aligning the physical planning, space, and real estate management functions, and the operations and maintenance assets to the institutional business plans. APPA uses these facilities management core competencies as an organizing framework for its educational programs including the Institute for Facilities Management and Leadership Academy; APPA-U. This framework is also used for structuring research initiatives through the APPA Center for Facilities Research (CFaR), for its credentialing and certification programs such as the Educational Facilities Professional (EFP) credential and Certified Educational Facilities Professional (CEFP), also is used for capturing and organizing data and information for use in the Facilities Performance Indicator (FPI) survey and report and the APPA Body of Knowledge (BOK). Each of the four core competencies is typically broken down further into specific facilities services functions, activities, or divisions. In essence, this creates some familiar facility functions and well-known organizational elements that assist in organizational design and alignment. The framework allows strategic grouping of tasks and activities for achieving effectiveness. Here again, the facilities manager is reminded of the distinctive choices of services for the facilities organization to provide and the choices of which services not to provide. As a profession, we have learned that we cannot be great at everything and that strategic choices matched to the organizations unique and competitive capabilities need to be made. “When thinking about capabilities, you may be tempted to simply ask what you are really good at and attempt to build a strategy from there. The danger of doing so is that the things you’re currently good at may actually be irrelevant to campus customers and stakeholders. Articulating the organization's core capabilities is a vital step in the strategy process. Identifying the capabilities required to deliver on the service choices you have made crystalizes the areas of focus and resource investment and allocation for the organization. This approach enables the organization to continue to invest in its current capabilities, to build up others, and to reduce the investment in capabilities that are not essential to the strategy. The APPA Core Competence Framework is used to illustrate strategic grouping practices for facilities management organizations. For the size of the organization, in this chapter, facilities management full-time equivalent (FTE) is used in the examples, arbitrarily classified as small (less than 100 FTEs), medium (100 to 500 FTEs), large (500 to 800 FTEs), and extra-large (800 to 1,600 FTEs). By comparison to large business and industry organizations, even our largest and most complex institutional facilities management organizations are quite small in terms of number of staff. The very largest of our facilities management organizations have fewer than 1,600 staff members, and the majority has fewer than 500 FTEs. Compared with corporate America — which most of the current management books, literature, and business school studies are targeting — facilities management organizations are indeed quite small. Using the APPA Core Competence Framework to help establish the lines of authority and who gets to decide what. The APPA Body of Knowledge includes chapters and sections for each of the four areas of the Core Competence Framework for help in understanding the comprehensive nature of the competencies and required organizational capabilities. The facilities manager who is designing or redesigning the facilities organization will find the choices contained in the framework an immense help in drawing the lines of authority. Small: Small facilities management organizations tend to rely on the director, assistant director, and perhaps one administrative specialist for facilities management administrative support. There is typically heavy reliance on the campus central administrative infrastructure for support for human resources, information technology, and business and financial services. Members of the facilities management team tend to wear many hats, and having specialists for these services in the facilities management department at the small organization is rare. Medium: Typically, the medium-size facilities management organizations will design organizations with staff specialists for administrative support. There are variations of the models in that some organizations have these administrative specialists reporting to a facilities manager, the director, associate or assistant director, or a facilities management department business officer. In other examples, these specialists will report to a campus-wide professional and either is co-located in the facilities management department or located as a part of a central services group who are assigned the responsibility for serving the facilities management department needs as well as the needs of other campus departments. These specialties typically include human resources, information technology, budget and finance, and procurement. Large and Extra Large: Characteristically, the large and extra-large organizations almost always have general administration and management professional specialists for human resources, information technology, and finance, often including accounting, procurement, and contract administration specialists. They recognize the strategic importance of these services and continue to invest in the development of these organizational capabilities. A common practice is assigning these administrative responsibilities to a professional business manager. Small: Typically, the small facilities management departments focus on the quality of basic operations and maintenance services with an emphasis on buildings, grounds, appearance, and building system and utility infrastructure reliability. Capital planning: design and construction, major remodeling, and alterations are typically provided by contract or some other affiliated agency. The chief facilities officer is highly engaged with other professionals in the planning, design, and construction processes, from programming through project closeout. The small institutions tend to contract some services for operations and maintenance as appropriate for the regional and geographical area labor markets and conditions. The institutional competitive position for labor is a factor as the ability to attract and retain the level of skills required for some operations and maintenance capabilities can be a challenge. Medium: The medium-size facilities management organizations tend to provide the full range of operations and maintenance services. They are large enough to benefit from scale for grouping of specialists where needed, and typically they are attractive employers in the area where professional, skilled, and semiskilled staff members are needed. Their use of skilled trades and multi-craft technicians highlights their approach to operations and maintenance. These medium-size facilities management organizations typically include utilities, energy management, and sustainability within an operations and maintenance organizational arrangement. They are also active participants in the campus planning, design, and construction of capital projects. Sometimes the planning, design, and construction responsibility is separated from facilities operations and maintenance and is structured under separate leadership. Where this is the structure, both parties typically realize the interdependencies and need for close cooperation and collaboration. Large and Extra Large: The large and extra-large facilities organizations have comprehensive operations and maintenance services offerings. Typically, they assume that all services and functions of importance and critical nature will be provided through in-house staff. Again, they take advantage of scale and hire and retain staff in the necessary specialty skills. The large and extra-large organizations use active staff training and development programs and management support systems to leverage the organization's competencies and increase organizational capacity. Some organizations have continued with comprehensive apprentice programs for the building skilled and semiskilled trades. They tend to structure the organization in a hybrid manner, with both centralized shops and services and through the use of zone or area maintenance methods. The majority of large and extra-large organizations have a comprehensive facilities management organization with all of the APPA core competencies structured under the purview of a single chief facilities officer. Small: The small institutions are active players in managing and providing energy, utility, and environmental stewardship. Often, only a few players are available for these responsibilities. Depending on the type and scale of the institution utility infrastructure, district heating and cooling, individual and stand-alone systems, or a combination of these, the small facilities management organizations tend to recognize the strategic importance of these competencies. Many have used partnerships to augment existing staff and have pursued energy service company assistance and methodologies to help manage the energy and utility portfolio. Medium: The medium-size institutions typically have staff for energy, utilities, and environmental stewardship responsibilities. These staffs are typically integrated into an energy and utilities management function in the operations and maintenance division of the organization. The environmental stewardship is a shared responsibility, and a facilities manager or the director will take a major role in guiding or overseeing the overall role of the facilities management organization in the institutional sustainability program. Coordination with other campus departments that also have a role in achieving sustainability is a requirement. Large and Extra Large: Facilities organizations of this size are generally very aggressive in leading the campus energy, utility, and environmental stewardship. In a number of instances at the large and extra-large campuses, energy, utility and environmental stewardship are structured as an enterprise operation; they fully recover their costs of operation and fund utility expansion and energy projects by recovering utility costs to campus departments. Where this is the case, utilities, energy, and environmental sustainability are often structured with a director reporting to the chief facilities officer rather than to an operations and maintenance director. Where this is the structure, those responsible are charged with energy and utility acquisition, production, distribution, and end user use and conservation of energy. There are a number of different business models that are in place to manage these critical functions. Campuses that have district-heating and cooling combined utility plant operations have exploited the advantages of co-generation and engineering efficiencies derived from this model. These campuses have all the complexities and business challenges of a major public utility. Small: The small facilities management departments most always depend on outside sources for this responsibility. Typically a campus administrator is assigned the responsibility for coordinating the planning effort. This does not imply that the chief facilities officer is not an active participant. It simply is not feasible to have planning, design, and construction staff in house for small campuses that do not have large capital programs on an ongoing basis. The small institutions will frequently align the capital planning functions including project programming, real estate management, space planning and management, design and construction functions with an associate vice president or vice president position. Medium: The medium-size organizations will typically have some capabilities to manage the planning, real estate management, space planning and management, design, and construction processes but typically must rely on outside professionals for many of these services. In many state institutions, the state serves a lead role and provides assistance in various ways when it comes to new construction or major remodeling/alteration capital projects. These state agencies are a partner with the campus facilities management department to fulfill the project requirements. Large and Extra Large: Many large and extra-large organizations have a full set of competencies for delivering capital planning, real estate management, and space planning and management, design, and construction services. These competencies include specialists in physical planning, architecture, design, and construction activities and in numerous instances include a campus-wide responsibility for space planning and management. It is not uncommon, however, to see organizations where the physical planning function is assigned to a campus entity that is not under the direction of the chief facilities officer. The institutional politics and the desires of the president/chancellor and chief academic officers generally drive variations in this organizational structure. Occasionally, we find atypical alignments of the facility triad; planning, design, and construction as well as operations and maintenance are separate entities, either reporting directly to the same campus administrator or even reporting to different campus administrators. In these instances, organizational unit leaders must develop strong organizational linking mechanisms to ensure that these three units, which have a number of legitimate interdependencies, are working well together. In the proper design of an organization, the choices of services to provide, how to provide those services, what quality and cost of services to provide, what management processes and support capabilities to provide to support those services, and how you choose to measure performance of the chosen services are all up to you. Ultimately, the combination of these choices accounts for the differences in facilities management organizational structures. When it comes to determining the quality of services or service standards, ultimately, the institution's priorities and the amount of resources available will determine the choice of services, staffing levels, and consequently the campus facility service levels. The college and university facilities management profession over at least the past five decades has had to deal with a constant flow of change requirements. Most of the change requirements evolved as advancements and modifications of conditions at our institutions, such as new leadership, changes in resources, and changes in the strategic drivers, including political, economic, environmental, social, and technological change. Other kinds of changes are specific to particular campus environments, such as campus growth, workforce diversity, generational and population demographic changes, adoption of advancements in information technology, changes in resource allocation methodologies, emergency preparedness requirements, regulatory requirements and unfunded mandates, and increasing costs of wages and benefits, energy, and construction. These are only a few of the areas in which there has been substantial change for the facilities manager. The facilities managers who were paying attention to their surroundings adapted to these changes, mostly in a controlled and evolutionary manner. Only a few changes stand out as having required major revolutionary steps and immediate or emergency actions to deal effectively with the change. Arguably, colleges and universities have enjoyed distinct periods of stability; major shifts in strategic orientation occur only rarely. Some examples of major shifts include the campus civil unrest of the 1960s, the war protests during the 1960s and 1970s, the energy crisis of 1973, the events of September 11 and its aftermath, and the global economic crisis of 2008. Through all of these major change events, most of our institutions continued to pursue a given strategic orientation articulated in the institutional mission statements that have remarkable similarities among institutions: the pursuit of teaching, learning, research, public service, and, where applicable, health care. Indeed, higher education has for a very long time enjoyed being highly valued by our society. Change is continuous, but in the higher education sector, it occurs in the context of a pretty stable strategic orientation. For much of higher education and in turn for the associated facilities management profession, change usually results in doing more of the same but striving to do it better. While this goes on in the higher education enterprise, the world outside continues to change, sometimes slowly and sometimes dramatically. Since the beginning of the twenty-first century, there seems to be increasing frequency of dramatic change that has spawned a much stronger sense that the institutional strategic orientation is increasingly out of sync with the world around us, both locally and globally. One cannot help but ask how facilities management organizations must change in the twenty-first century. Is it time for a new organizational view and a different theory of how to deal with change? “The practices and processes of modern management have been built around a small nucleus of core principles: standardization, specialization, hierarchy, alignment, planning and control, and use of extrinsic rewards to shape human behavior. These principles were elucidated early in the 20th century by a small band of pioneering management thinkers, individuals like Henri Fayol, Lyndall Urwick, Luther Gullick, and Max Weber. While each of these theorists had a slightly different take on the philosophical foundations of modern management, they all agreed on the principles just enumerated. This concordance is hardly surprising, since they were all focusing on the same problem: how to maximize operating efficiency and reliability in large-scale organizations. Nearly 100 years on, this is still the only problem that modern management is fully competent to address. “Hierarchies may have gotten flatter, but they haven't disappeared. Frontline employees may be smarter and better trained, but they are still expected to line up behind management decisions. Lower-level managers are still appointed by senior managers. Strategy still gets set at the top. And the big calls are still made by people with big titles. There may be fewer middle managers on the payroll but those that remain are doing what managers have always done; setting budgets, assigning tasks, reviewing performance and cajoling their subordinates to do better. Additional evidence of the persistence of hierarchies in facilities management is also provided through documented results of on-campus assessments of facilities organizations and discussions with facilities managers across the country. The fact that organizational hierarchies are here to stay can also be validated by a website review of college and university facilities management organizational structures. No facilities management organization was found that has designed a truly innovative management model of organizational structure that is significantly different from the hierarchical model. After all, this form of organizational structure has provided an enormous amount of comfort and has contributed much success for the facilities professional. Most chief facilities management officers have shown little appetite to create radically new organizational forms and capabilities. Under pressure to perform in a changing environment, chief facilities management officers clearly have more comfort and tend to concentrate their efforts on improving the efficiencies of existing organizations by applying conservative and time-tested methods. This is simply a logical and lower-risk way of "doing what we know" in a different way and arguably has served the facilities management practitioner well. Because the hierarchical form of organizational structure is here to stay — and from all indications looks like it will continue to predominate the profession — the chief facilities management officer can in fact do a number of things that might not directly change the hierarchical structure configuration in a dramatic way but rather might enhance the hierarchy and prepare the organization for a new and different future. When contemplating the need to adapt to change, we can select from a number of alternatives, only one of which is reordering the organizational structure. A healthier hierarchy, or perhaps a rewiring and a retooling of this legacy management and organizational model, might be the new prescription for success. Sometimes the mere application of new technology or process improvement can meet changing service requirements; address training for managers, supervisors, and frontline staff; and provide a different mindset for managing and developing new skills and competencies. These things can be done without undergoing major reorganization. In The Boundaryless Organization: Breaking the Chains of Organizational Structure14 the authors Ron Ashkenas, Dave Ulrich, Todd Jick, and Steve Kerr present the idea that managers must recognize the new success factors for the twenty-first century and that the hierarchical pyramid-shaped organizational structures that exist for most of us come with four types of boundaries that are both controls and constraints on the organization. These boundaries affect how work is done, what roles and responsibilities are assigned, how information flows, who makes decisions, and where accountability lies. The new success factors, according to the authors of The Boundaryless Organization, are speed, flexibility, integration, and innovation. These success factors either augment or replace the old organizational success factors, which include size, role definition, specialization, and control. As mentioned earlier in this chapter, there is the need to rethink the organization to help us recognize how facilities management work has changed and consequently how to use organizational structure to find new ways of delivering services. Past practices of designing organizations make it more difficult for facilities management organizations to change as the organization faces new and inescapable challenges that are testing our business-as-usual practices; our thinking about design of the organizational structure is linked to our past. New success factors for the facilities management profession — speed of service, flexibility, integration, and innovation — are not unlike those required for much of business and industry. It will be impossible to achieve these success factors without maximizing human potential in the organization. The once-murky bottom line for facilities managers is becoming clearer. An example of responding to this is an increase in use of the zone maintenance concept, a form of organizational structure typically added within an existing facilities management hierarchy to respond to some of the new success factors driven by campus growth, geographic dispersion, and emphasis on improving customer relationships, flexibility, and faster response times. Past practices of organizational design have created boundaries in all directions: vertical, horizontal, external, and geographic. These boundaries need to be examined and assessed to determine the effect they have on the flow of information, decision making, cooperation, and collaboration and hence on the organization's ability to master each of the new success factors. Getting ahead of the success curve requires a change in the old paradigm of the manager's job: planning, organizing, coordinating, and controlling. These four words have dominated management vocabulary since the French industrialist Henri Fayol introduced them in 1916, and they are apparently more and more out of step in today's workplace. Thinking of the manager's job in terms of coordinating and cultivating rather than commanding and controlling opens up a range of new possibilities. Technology has changed the nature of work and the way that we approach getting the work done. The knowledge worker is here to stay. About 60 years ago, Peter Drucker coined the term knowledge worker to describe a new class of employee whose basic means of production is the productive use of knowledge. Today, these knowledge workers, who are frequently called professionals, represent a larger and growing percentage of our facilities management workforce. Marshall Goldsmith writes in Leading New Age Professionals, "Knowledge workers are professionals who know more about what they are doing than their boss. In leading these new-age professionals, it is important to be able to invert the pyramid, and look at organizational leadership from the wants and needs of the professional, as opposed to the perspective of the skills of the leader." There is ample evidence that the advent of the knowledge worker and the overall use of information technology, especially communication technology, have been a major influence the past decade in changing facilities management organizational design and practices. Information technology, in particular, has had a large impact on the way work is done. As Henry C. Lucas Jr. points out in his book The T-Form Organization: “Using Technology to Design Organizations for the 21st Century, the job of leading an organization has changed the way organizations do business with information technology; many of these ways are used by facilities management organizations, and new ways to use technology are being applied daily”16. Most organizations have embraced the use of information technology and the advent of the knowledge worker found today throughout the facilities management profession. Although the initial idealistic belief that technology would make work easier and free up managers' time and even shorten the work week has not been fully realized, there can be no question that the appropriate use of technology throughout facilities management organizations does make a difference and matters greatly. Information technology is a variable that must be considered in the design of organizations. This discovery and use of information technology as both a driver and an enabler have been a boon to facilities organizations. The degree to which technology is used and the growth and positioning of the knowledge worker in our facilities organization are variables that can significantly affect organizational design and especially how work is done. These variables have piled into and loaded up the hierarchy, and this process has not always been done in a planned, orderly, and coherent way. This situation has presented new organizational challenges, especially for midlevel managers who are primarily in the organization to hold things together. The term learning organization is gaining more popularity. Exactly what this means to facilities management organizations is not obvious. This much, however, we do know: Continual learning for improvement is an essential ingredient and perhaps the ultimate goal of the learning organization. The challenge is to continually strive to do better, to gain an edge, and to instill best practices in an organization. Successful facilities management organizations are about much more than structure. Success involves changes in thinking about workforce capacities, about the way people are asked to work, and about how we think about and act on leadership and ownership of problem resolution. David A. Garvin, professor of business administration at Harvard Business School, has done substantial research on the concepts and practices of the learning organization. In his Harvard Business Review article, "Building a Learning Organization," Garvin emphatically states, "Continuous improvement requires a commitment to learning. How, after all, can an organization improve without first learning something new? Solving a problem, introducing a product or service, and reengineering a process all require seeing the world in a new light and acting accordingly. In the absence of learning, organizations and individuals simply repeat old practices." There are ample rewards for facilities managers who recognize this connection between learning and continual improvement. The concept of the learning organization has more to do with what goes on within the organization than with how the organization is structured. However, organizational structure can inhibit or advance learning and can add to a mindset that discourages or encourages the creation and sharing of knowledge. An organizational structure that establishes a supportive and open environment for learning will be better equipped to deal with the increasing complexity and continual change that are synonymous with the facilities management profession. Facilities managers have strived to engineer the optimum organization — that is, to obtain the highest performance efficiency while maintaining value-added services and to deliver those services consistently and effectively. The ideal condition is to design a structure that will have lasting value and work for all time, a sustainable organizational configuration with no frequent changes necessary. However, the campus in reality produces a constant flow of changing service requirements. This reality has taught us that such a static organizational orientation cannot work indefinitely. No organization, regardless of its size, is immune to change. Nearly all sectors of facilities management services are affected. Management must be selective in making change but nevertheless must embrace and incorporate the appropriate changes into the organization. For the practicing manager, an important lesson in the twenty-first century is that organizations face new and different challenges that lie outside the realm of what had to be managed in the past. There is no escaping these challenges. Challenges facing Educational Facilities Professionals today are different from those of the past. Organizations are not static; today, many facilities management organizations are facing a need to transform themselves into dramatically different organizations because of new challenges in the campus environment and the external environment. Consequently the concepts and practices of organizational theory and design are continuing to evolve. The most up-to-date research of hundreds of facilities management organizations of all sizes, and library review of books and other publications writings on the topic of organizational design provide a large knowledge base for making facilities management organizational designs more effective. The institutional profile and its context, and the facility management organizations capabilities and capacity are two very important factors which influence organizational design. The education facilities management profession demands periodic reorganization. Reorganization is a powerful tool for changing the trajectory of an organization and enhancing its performance. Yet, the results of organizational design and reorganization are often disappointing for facilities managers who want to position their organizations to adapt to new needs. Most facility organizations find their organizational agility; its capability to make timely, effective, and sustained change, to be a substantial challenge and consequently their overall performance suffers. Some specific challenges today that impact facilities management organizational design include; campus growth and expansion, imperatives to understand customer needs, customer goals and what customers value. There are increasing expectations to be more effective by responding to needs more rapidly and with more agility, demands to continually manage costs and become more efficient, obligations to continuously improve and to be competitive, and continued pressure to do more with less. These challenges and others represent a number of “new normal “situations that are forcing the facilities manager to confront a new reality of organizational purpose, , organizational strategy, organizational capability, and accordingly, organizational design. Adding to the complexity of the challenge are continuing expectations that facilities management organizations will make progress on the old familiar challenge of leading the institution in its asset management and capital needs responsibility. This increasing emphasis on the stewardship requirement is taking place at a time when institutions are facing daunting financial challenges in managing the cost of a higher education degree. Major change to the campus environment and business landscape; such as expansion or contraction without organizational structural adjustments will only lead to economic inefficiency, and deficiency in meeting campus needs. Changes in campus workforce and workplace expectations are additional challenges that affect organizational design. These factors also place demands on facilities leaders to stay current and develop state-of-the-art work management and work-flow processes. Workforce attributes that are paramount to realizing a successful facilities organization today include effective responses to increasing demands for exemplary talent management, continual development of essential capabilities, continuity of operations, leadership development and succession, and constant nurturing of personal proficiency. Additionally, this includes technical skills, leadership skills, and accomplished competencies in ethics and professional standards. The increased use of information technology adds to the challenges as well; the digital workplace, and big-data. If this weren’t enough, facility managers are expected to deal effectively with campus safety and security provisions, complex environmental compliance requirements, and new demands to meet the challenges of an increasingly diversified and complex workforce. These are the forces that are shaping today’s organizations. Thus, managers must be prepared to design and redesign their organizational structures as these changing service requirements and specific-institutional contextual conditions unfold. A good organizational structure is critically important if the facilities organization is going to adapt to these realities and other changes that will inevitably continue to alter the campus facilities management landscape. Therefore, understanding of organizational theory and organizational design is required for successful leadership. The kind of organizational design change likely to be required for success will place new stresses on the organization's activities, on relationships, and on the kind of decisions that need to be made downward, horizontally, and upward. Consequently, changing the way we manage and the way our organizations perform work to be able to fit the needs of the institutional environment is a viable alternative and a significant complement to rearranging the configuration of the organizational structure. This approach likely will prove to be an effective prescription that is more aligned with today's twenty-first-century requirements. 1 Daft, Richard, Organization Theory and Design, Tenth Edition. Mason, Ohio: Cengage Learning, 2012. 2 Magretta, Joan, What Management Is-How it works and why it is everyone’s Business. Copyright @2002 Joan Magretta, Free Press-A Division of Simon and Schuster Inc.
3 Chandler, Jr. Alfred D., Strategy and Structure: Chapters in the History of the American Industrial Enterprise, copyright 1962 by Massachusetts Institute of Technology. 4 Daft, Richard, Organization Theory and Design, Tenth Edition. Mason, Ohio: Cengage Learning, 2012. 6 Daft, Richard, “Organization Theory and Design”, Tenth Edition, Mason, Ohio: Cengage Learning, 2012. 8 Galbraith, Jay R., “Organization Design”, Addison Wesley Publishing Company, 1997. 9 Mintzberg, Henry, “The Structure of Organizations” Copyright@ 1979, Prentice Hall Inc.
10 Goold, Michael, and Andrew Campbell, Harvard Business Review, March 2002. 11 Drucker, Peter F., “The Practice of Management”, New York: Harper Business edition, 1993; Collins edition, 2006. 12 Middleton, William D., "Comprehensive Facilities Management" In Planning and Managing Higher Education Facilities: New Directions for Institutional Research, No. 61, edited by Harvey H. Kaiser, 62. San Francisco: Jossey-Bass, 1992. 13 Hamel, Gary, with Bill Breen, “The Future of Management”, Boston: Harvard Business School Press, 2007. 14-15 Ashkenas, Ron, Dave Ulrich, Todd Jick, and Steve Kerr. The Boundaryless Organization: Breaking the Chains of Organizational Structure. San Francisco: Jossey-Bass, 2002. 16 Lucas Jr., Henry C., ”The T-Form Organization” using Technology to Design Organizations for the 21st Century, Copyright @ 1996, Jossey-Bass Inc.
17 Hug, Jack (Hug Consulting and Management Services). APPA Facilities Management Evaluation Program (FMEP) Conclusions" APPA, 2016.